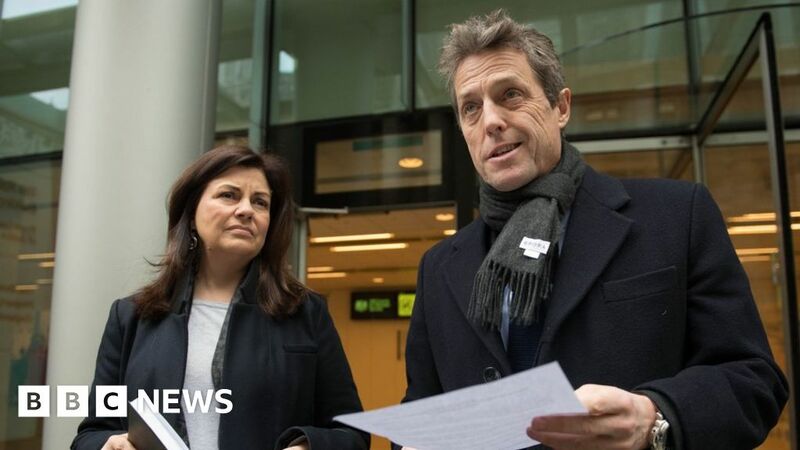 Actor Hugh Grant has settled a phone-hacking damages claim against Mirror Group Newspapers at the High Court. It is understood the star will be paid a six-figure sum, which he will donate to the campaign group Hacked Off. The actor said the newspaper group had been guilty of phone hacking on an “industrial scale” and called for another public inquiry to “get to the truth”. MGN said it “deeply regretted” the acts and described them as “morally wrong”. Grant, 57, appeared at the court in London to hear his lawyer give details of the hacking settlement. Anjlee Saigol told Mr Justice Mann the action against the Mirror Group related to the alleged illegal misuse of Grant’s information obtained by hacking his voicemails, masquerading as other people, and surveillance. The action related to employees at all three of MGN newspapers – the Daily Mirror, Sunday Mirror and Sunday People. As part of Monday’s settlement, MGN admitted that senior employees including its editors, executives and journalists “condoned, encouraged or actively turned a blind eye” to the culture of phone-hacking, lawyer Ms Saigol said. The offences took place between 1998 and 2009 under the editorships of Piers Morgan and Richard Wallace at the Daily Mirror and Tina Weaver at the Sunday Mirror. The three former editors, along with ex-chief executive of Trinity Mirror Sly Bailey, had previously given evidence to the Leveson Inquiry and denied knowledge of phone hacking at MGN. Their statements to the inquiry were later found to be “wrong, not just disingenuous” in a court ruling in 2015. Speaking outside court after Monday’s hearing, Grant said: “This case was not just about what they did to my phone and those close to me. “In this litigation my lawyer and I pressed further because I was determined to uncover the truth about the nature of high-level concealment at the Mirror Group. Hugh Grant arriving at the Rolls Building in central London for the High Court hearing. “This newspaper group has misled the public and its shareholders for many years; and it has let down its readers and its hard-working journalists. Grant’s lawyer Anjlee Saigol added one of Grant’s main reasons for pursuing the case was to establish the truth about the group’s investigations and knowledge of its unlawful activities before it admitted them in September 2014. She also said the company “actively sought to conceal its wrongdoing from its many victims of intrusion” and admitted intrusions into people’s lives could have been prevented. On Monday, the judge also heard details of settlements against MGN by actor Ralf Little and Rupert Lowe, who was the executive chairman and joint managing director of Southampton Football Club between 1999 and 2006. Former police officer and Crimewatch presenter Jacqui Hames also settled her action against News Group Newspapers, publishers of the News of the World. Speaking for MGN, Alex Wilson said: “MGN accepts that the unlawful interception of voicemail messages and procurement of private information about Mr Grant and others should never have happened. The newspaper has been taken to court multiple times over claims of phone-hacking. In October last year, comedian Steve Coogan was the latest in a long list of more than 40 celebrities to have settled phone-hacking claims against MGN. They include Lord Archer, footballer Kevin Keegan and actresses Patsy Kensit and Michelle Collins. Grant, who is known for films including Notting Hill and Four Weddings and a Funeral, has been one of the leading voices in the campaign for stricter press regulation. In 2012 he accepted a “substantial sum” in damages from the now-defunct News of the World. Grant was one of the victims of the paper’s widespread phone hacking, which led to its closure in 2011. He gave evidence at the Leveson Inquiry into press ethics, set up following the News of the World phone-hacking scandal.